Travel photos, tourism and tourists, adventure and exotic photos. 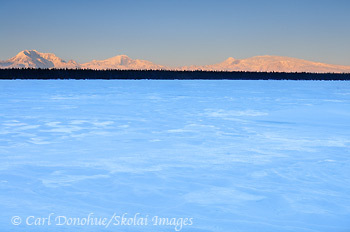 Willow Lake and the Wrangell Mountains, wintertime, Wrangell - St. Elias National Park, Alaska. From left to right, Mt Drum, Mt Sanford, Mt Zanetti, Mt Wrangell. Please click on the image above to view a larger version of this photo. Well, maybe not all of them, but some of the stars, for sure. Mt Drum, Mt Sanford, Mt Zanetti and Mt Wrangell, viewed from Willow Lake, along the Richardson Highway. It’s not always this clear, however, and so many of the people who drive by this scene have no idea what they’re missing. Perhaps more amazingly, when it IS clear, some people drive right by without so much as a glance. 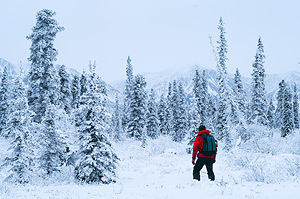 This entry was posted in Alaska, Landscapes, Travel, Winter, Wrangell - St. Elias National Park and tagged Copper River basin, Landscapes, Mount Drum, Mount Sanford, Mount Wrangell, Mount Zanetti, Richardson Highway, scenics, Willow Lake, Winter, Wrangell - St. Elias National Park, Wrangell Mountains on March 9, 2011 by Carl D.
Backpacking up Hidden Creek, in the Wrangell Mountains, near Kennicott, Wrangell - St. Elias National Park and Preserve, Alaska. To view a larger version of this image, please click on the photo above. Here’s a shot again from the Hidden Creek backpacking trip this past summer. Well, if one can really call the last week of August in Alaska “summer”. We had a great time on the trip, as I mentioned in a few earlier posts, in particular because we were fortunate enough to have some fine weather. Those big sunny skies make the world of difference when you’re sleeping, eating and doing everything else under them. I miss the summer already! Right now we’re kind of in that dead era between fall and winter. I’ve been back from my last trip (photographing grizzly bears in Katmai National Park) over 2 weeks now .. the longest stint i’ve spent inside the house since May. I think next week I’ll try to head to somewhere and sleep in my tent again. I need some wilderness, especially after sitting in a court room all week (so far) doing my civic service of jury duty. This particular hike was rewarding as well,, because last year I did this section as part of a longer route, from Nugget Creek to Kennicott – 65 miles through the Wrangell mountains. However, most of the trip was under socked in, gray, cloudy skies, cold damp air and gusts of winds. It was a treat to get to see at least some of what we hiked through in the fog. 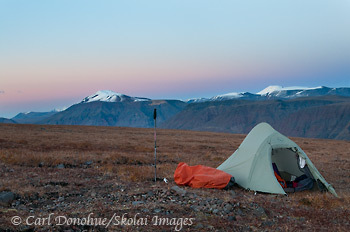 This entry was posted in Adventures, Alaska, Backpacking and Hiking, Landscapes, Travel, Wrangell - St. Elias National Park and tagged backpacking, Expeditions Alaska, Hidden Creek, Wrangell - St. Elias National Park on October 21, 2010 by Carl D.
A backcountry campsite (Big Agnes Seedhouse SL1) high on the tundra in the Wrangell Mountains. 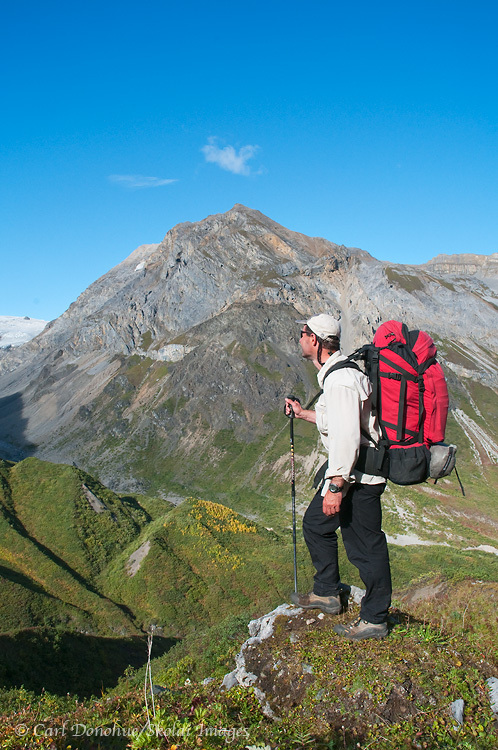 The high alpine ridges near Mt Jarvis, Wrangell – St. Elias National Park and Preserve provide a great place for hiking and backpacking. 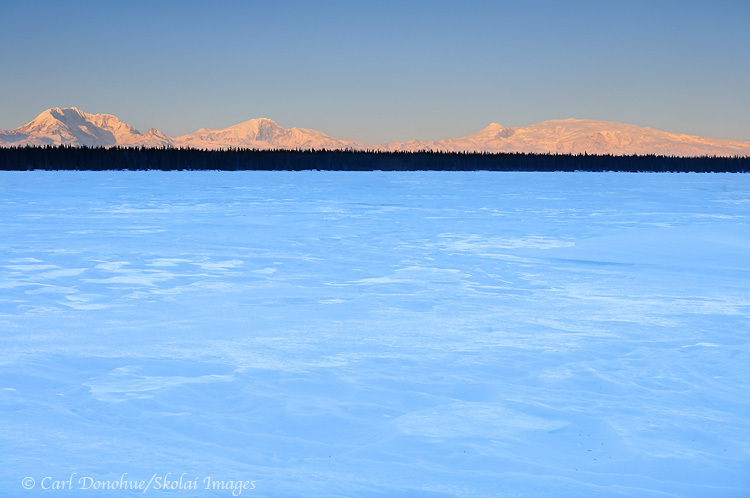 Sunset, Wrangell – St. Elias National Park and Preserve, Alaska. Please click on the image above to view a larger version of the photo. Just to stave off the impending deluge of grizzly bear photos, I thought I’d drop this one in here. This is from the last backpacking trip of the season for me, the recent Mt Jarvis excursion. Here’s a campsite I picked out all by myself, high on the tundra. With a night so wonderfully clear, the temperatures dropped down a bit during the evening, and it was plenty cold in the am when I awoke before dawn, and sauntered across the tundra to ‘reflection pond’, where I shot some of the recent images posted of Mt. Jarvis. This entry was posted in Adventures, Alaska, Backpacking and Hiking, Landscapes, Travel, Wrangell - St. Elias National Park and tagged backpacking, Wrangell - St. Elias National Park on October 6, 2010 by Carl D.
The Copper river and Mt Drum, from Simpson Hill Overlook. 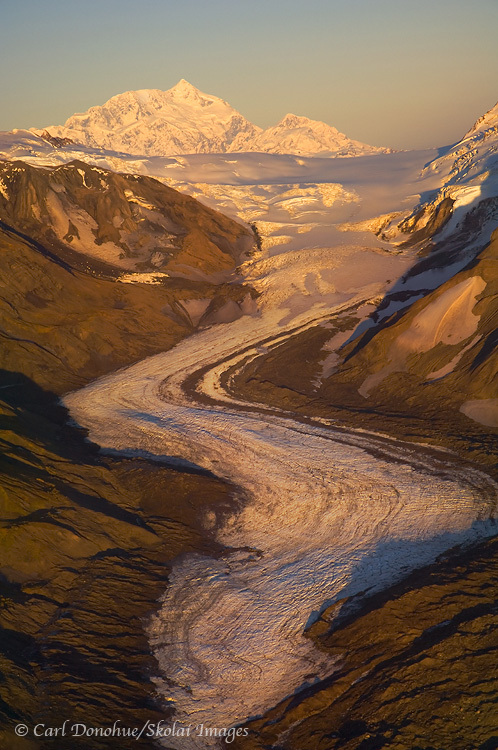 View of the Copper River basin and Wrangell Mountains, Wrangell – St. Elias National Park and Preserve, Alaska. Please click on the image thumbnail to view a larger version of this photo. OK, enough with the waterfalls already! Here’s another image from my spring trip earlier this year, from Simpson Hill Overlook, off the Richardson Highway, near Glennallen, Alaska. This is a scene I’ll never tire of; looking down the Copper River, with the Wrangell Mountains in glorious sunshine. The mountains you can see in this image are Mt. Drum on the left and Mt. Wrangell the broader, dome-shaped mountain on the right in the background. Just out of sight to the left of the frame is Mt. Sanford, and Mt. Blackburn to the right. How many vantage points do you know of in North America where you might choose to exclude from your photo two mountains both of which stand over 16 000′ high? That speaks volumes, in my opinion, about how amazing this viewpoint is. The 5th (Blackburn) and 6th tallest peaks (Sanford) in the US and they don’t make the photo? Craziness! The Copper River is pretty grand too. Not to get bogged down by meaningless numbers and superlatives, but the Copper River is 300 miles long, and the 10th largest river, by volume, in the US. The Copper River is also the north and western boundaries of Wrangell – St. Elias National Park and Preserve, coolest park in all the world! It’s perhaps best known, however, for its nearly infamous Red Salmon run, usually over 2 million spawning salmon, loaded with fatty Omega-3 oils that make for some delicious supper. I was really hoping for some sweet delicious alpenglow on this particular evening …. but ….. alas, such wasn’t to be my fortune. The light faded soon after I shot this – the boreal forest in the foreground grew dark, and the mountain light ebbed and dwindled; distant dim clouds low on the northwestern horizon thwarted my efforts at capturing some rich color on the snow-capped peaks, as seems to be the case all too often. 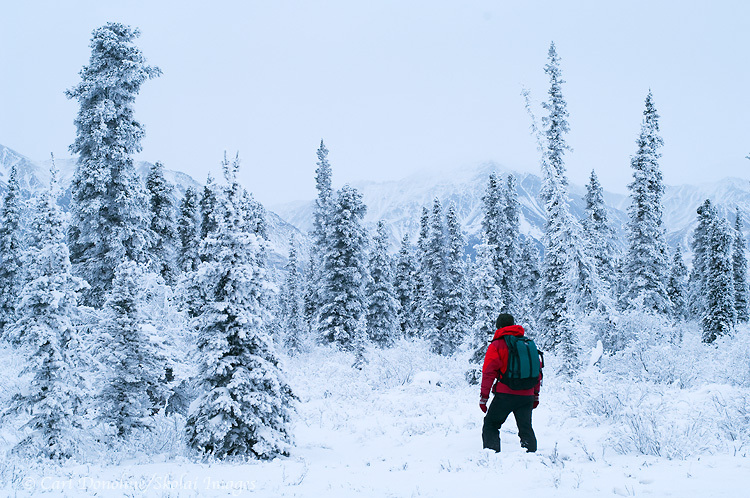 This entry was posted in Alaska, Forests, Landscapes, Travel, Wrangell - St. Elias National Park and tagged boreal forest, Copper River, Copper River basin, Glennallen, Landscapes, Mt Drum, Mt Wrangell, Richardson Highway, scenics, vistas, Wrangell - St. Elias National Park and Preserve, Wrangell Mountains, Wrangell St. Elias on August 16, 2010 by Carl D.
Standing alongside Horsetail Falls, near Valdez, on the Richardson Highway, Alaska. Please click on the image thumbnail to view a larger version of the photo. Here’s another photo from my trip down the Richardson Highway – Memory Lane. This one is Horsetail Falls, another waterfall in keystone Canyon, just south of Bridal Veil Falls, the image I posted earlier. Waterfalls are so cool; I can sit and stare at a waterfall for hours, it seems, never tiring of the flow. 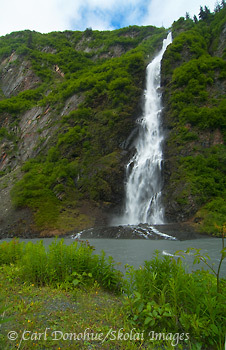 The energy of the falls is often spellbinding. 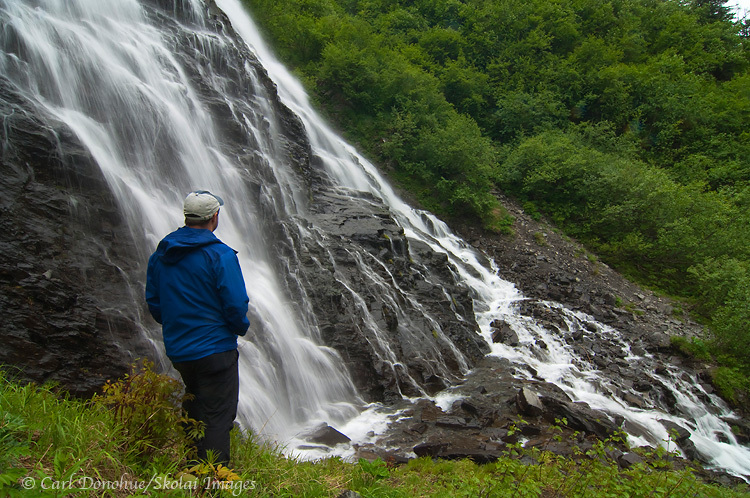 This entry was posted in Adventures, Alaska, Landscapes, People, Travel and tagged Horsetail Falls, Keystone Canyon, Lowe River, scenics, tourism, Waterfalls on August 12, 2010 by Carl D.
Bridal Veil Falls from the Richardson Highway, near Valdez, Alaska. Keystone Canyon, Lowe River, Chugach Mountains, Central Alaska waterfalls. To view a larger version of the photo, please click on the thumbnail. Here’s a photo I took this spring on a quick trip down the Richardson Highway to Valdez. Kind of a spur of the moment thing, I took off from Glennallen one rainy, nasty morning to revisit the area. I hadn’t been down to Valdez in years, and so it was a nice way to spend what looked like might be a day of dreary weather. 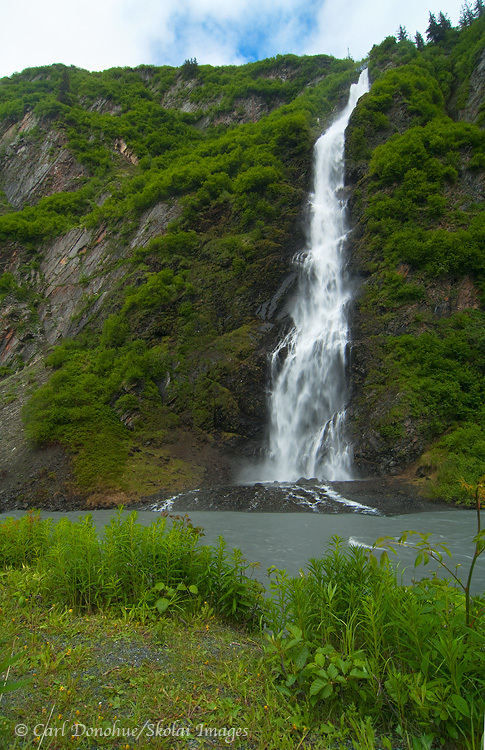 I also wanted to photograph a couple of the waterfalls along the road, this one and Horsetail Falls as well, which is just around the bend from Bridal Veil Falls. This kind of location is difficult to shoot, for me, as the scene doesn’t offer a lot of options regarding a vantage point. The river in the foreground, Lowe River, is uncrossable, unless you have a boat. I, of course, did not have a boat with me. So the photographer here is pretty limited to shooting from across the river, and that makes it difficult to come up with any compositional variations. Similarly, without a heavy overcast day, including the sky wasn’t a great option either. The road runs immediately behind where I shot this image from, so backing away would drastically change the nature of the photo, by including the road in the foreground. Not necessarily a bad thing, but that wasn’t what I was looking for. Perhaps I’ll go back one day in better conditions and shoot it again, with the road and a motor vehicle in the foreground, as a ‘travel photo‘. This entry was posted in Alaska, Landscapes, Travel and tagged Bridal Veil Falls, Keystone Canyon, Landscapes, Lowe River, scenics, Valdez, Waterfalls on August 8, 2010 by Carl D.
Coastal plain, Arctic National Wildlife Refuge, Alaska (aerial photo). Last night I attended public comment hearing for the preliminary stages of a Comprehensive Conservation Plan (CCP) for the Arctic National Wildlife Refuge (ANWR). In short, this comment period allows the public to offer information and thoughts on some of the issues they feel might need to be addressed, and oftentimes their thoughts as to how those issues should be addressed. The CCP will be a document that “outlines and guides long-term management” of the Refuge. The US Fish and Wildlife Service (FWS) are the land management agency responsible for managing the Refuge. If you would like to add your input at this stage, here is Comment Form for the Refuge. Before you do, it’s worth browsing the FWS ANWR webpage for some useful ideas on how this works (they’re not looking for reasons why the coastal plain might or might not be opened to drilling – that decision is to be the work of Congress, not the simple folks of the FWS). One of the critical topics up for discussion is the designation of “wilderness” in the Refuge. 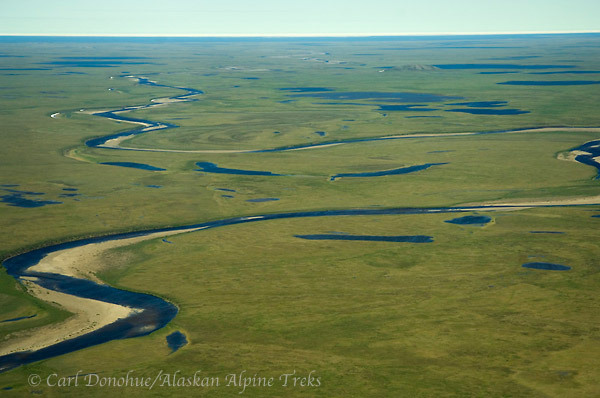 Currently, nearly half (41%) of the Arctic National Wildlife Refuge 19.3 million acres is designated wilderness. The remaining 10 million acres are not currently designated “wilderness”. The FWS are presently proposing to study these areas and determine whether or not they qualify as wilderness; the ‘Wilderness Review‘ section of the CCP. 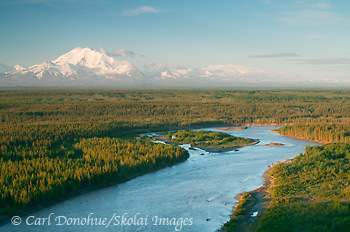 A recommendation could then be made to Congress to designate these areas wilderness. Such a designation would render the Refuge off-limits to oil and gas extraction. 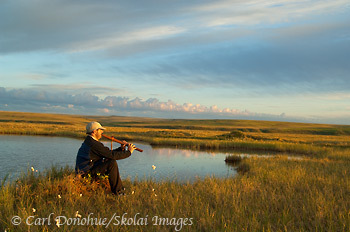 This entry was posted in Adventures, Alaska, ANWR, Environmental Issues, Landscapes, Musings, Rafting, Rants, Travel and tagged ANWR, Arctic National Wildlife Refuge, coastal plain, Section 1002, wilderness on May 13, 2010 by Carl D.
Playing a Native American Indian flute on the arctic coastal plain, Arctic National Wildlife Refuge (ANWR), Alaska. Please click on the image to view a larger version of the photo. I’ve been wanting to write for the last week about the current Gulf Oil disaster, but haven’t really been quite sure what to say. There are simply so many tangents to this mess that I’ve not known where to start. The deaths of 11 people seem, unfortunately, to fade into the melée of concern about big oil, political ineptness, poisoned ecosystems, fathomless litigations, ad infinitum. The web we weave seems larger than the spread of oil. It makes sense, to me, to start at home. The reality is that this catastrophe stares us right in the eyeball. The mirror reflects our own lives – I drive a car, I love my gore-tex and silnylon tents, my synthetic-fill jacket, my polycarbonate cameras. I eat fresh bananas and whole grain breads shipped here from afar. My computer was flown directly from Shanghai, China. The world I live in is a fossil fuel world. That world includes crude oil belching from the ocean floor into the Gulf of Mexico, and on to Gaia knows where. This entry was posted in Adventures, Alaska, ANWR, Backpacking and Hiking, Environmental Issues, Landscapes, Musings, People, Rants, Travel and tagged ANWR, Arctic National Wildlife Refuge, Gulf of Mexico, oil on May 6, 2010 by Carl D.